A 44-year-old man was arrested on suspicion of driving under the influence of drugs on the first day of Essex Police’s annual Christmas crackdown on drink and drug driving. The man, who is from Chelmsford, was arrested in Shenfield Road, Brentwood at 9.45am on the morning of Tuesday 1 December. He has been released on bail pending further enquiries until 26 January 2016. 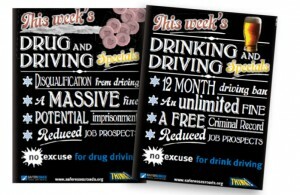 Essex Police is supporting SERP’s No Excuse for Drink and Drug Driving campaign which runs throughout December. Officers are encouraging anyone with information about people who regularly get behind the wheel under the influence of drugs or alcohol to call Crimestoppers. Adam Pipe, Casualty Reduction Manager at Essex Police, said: “The community can play a significant part in supporting safer roads over the festive period. “Our efforts to identify people who use their vehicles under the influence of drink or drugs and risk harming not only themselves but other road users are strengthened by the flow of information and intelligence from members of the public.